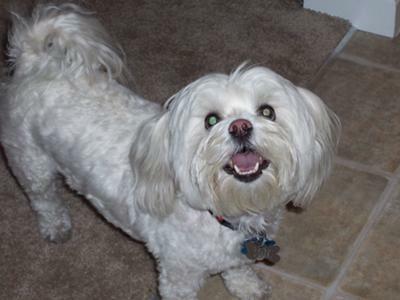 Kobi (formerly DJ, short for Dale Jr.) is a Maltese Bichon Frise mix rescue. Believe it or not, his previous owner would stick him outside and throw a handful of dry dog food out when she left to go to work at 6:30 AM so he could run loose until she came home sometimes after 10:00 PM and sometimes not at all! Rumor has it that Kobi eventually started going to his neighbor's house because he knew they would take care of him. Since the neighbors knew I had recently had my beloved 18 year old Maltese (Sebastian) put to sleep, they strongly encouraged Kobi's owner to either give him to me or put him up for adoption. That is how I ended up with this wonderful dog! My Maltese Bichon is such a character! When I got him, he was only about a year and half old and only weighed about 6.5 lbs. It still weighs heavy on my mind about that poor little dog running around like he did. It's kind of cute that he is almost like a wild animal... if he has food left over he tries to bury what is left in the sofa, or his bed, and if he happens to come across anything smelly in the yard, he feels that he should roll around in it. At eight years old now, he still has the energy of a puppy and loves to throw his toys in the air and attack them. My Maltichon always greets me (his "real" mommy) at the door and even sulks if he realizes it is someone other than me coming home. 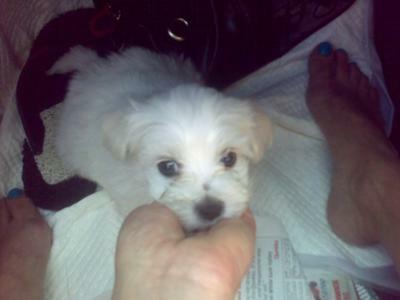 My Maltese Bichon Frise mix is now 2 years old he is very energetic and loves to please. He will fetch the ball he plays catch and also loves to be a fielder for cricket he even trys to be the bowler. I find him to be very intellegant and think he understands everything I say to him. He loves to swim in the ocean loves the water and rolling in the sand. 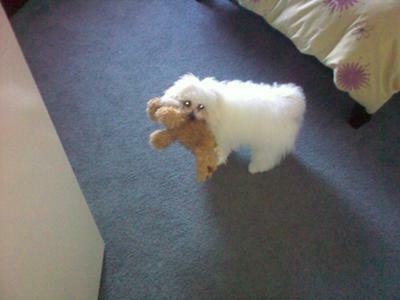 My Maltese Bichon Frise loves to bark especially if there is sudden noise. Doesn't think to much of cats and large dogs. He loves his walk down the park and to see all his little buddies down there. 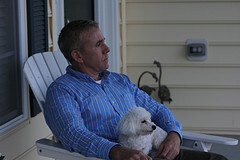 Patches is a quiet, gentle Maltese Bichon, but can be very protective of his owners. He is a good watch dog and will bark whenever he hears someone coming into our yard or at the front door. He is a playful dog but very loving. He was also very easy to potty train. It took us only one day to paper train him and was potty trained outdoors within a matter of days. 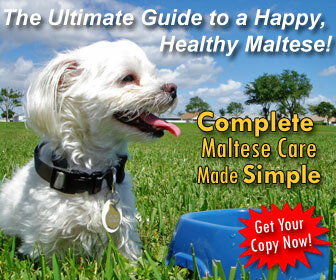 Maltese Bichons are very smart and learn fast. I recommend this breed as a companion dog. He was very playful as a puppy and is still playful, but has calmed down with age and is a good lapdog. Patches is now a year and 5 months old. He a 1/2 Shih Tzu and 1/2 Maltese. 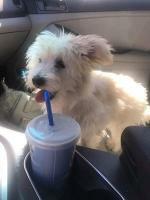 Maile is 3-1/2 months old and is 3/4 Maltese and 1/4 Shih Tzu. 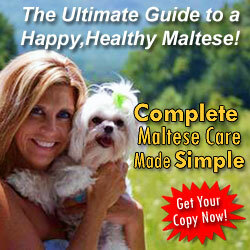 Her features are more Maltese. She is shorter in stature than Patches and is white with light lemon colored ears. She is a very playful puppy and loves to be around children. My Malshi will wiggle in your arms when she is excited and will shower you with kisses. Two Paws UP! for Patches and Maile! 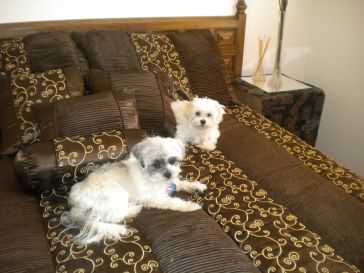 Hi Guys, We are two Maltese dogs LuLu and LoLLy! We think your pikture is one of the cutest we have ever seen! We want to give you Two Paws UP! for the AWESUM post! Also, did you hear about our health care debate? We would love for you two be ambassadors! Check it out at http://www.luluandlolly.com! Your Maltese paLs, LuLu and LoLLy! 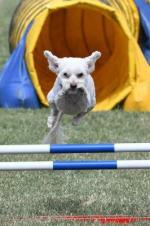 Jo-jo is a darling four year old Bichon Maltese boy. He was rescued from a pound. 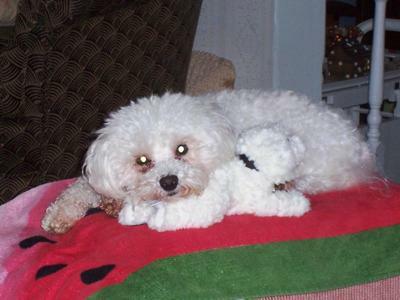 He was about to be put down and was saved by a Bichon Rescue group, who thought he might be a Bichon Frise. After he was shaved down, and his hair grow back, I kept thinking this is not a Bichon, he looks more Maltese. He has a great personality. Gets along with all dogs and people. He is a bit of an attention hog. He can't stand anyone getting more attention than the other dogs. If they are getting petted, he puts his face in the way so he can be petted. He loves to run with the "big boys". The bigger the dog the better. If they won't chase him he barks at them until they will. So unlike a Bichon personality. He has lots of energy, but at the end of the day he is the first to fall asleep, and then doesn't wake up until the morning, kind of like he wore himself out. He chases squirrels and birds. He is very observant and spots them up in the the trees. He barks at them until they move a way. You couldn't ask for a better, more loving dog. My Bichon Maltese is 12 lbs. My Bichon Frise mix TJ looks like all of these little pooches. 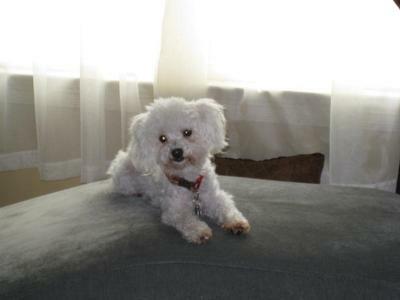 She has a Bichon body with a Maltese head, long silky ears and soft loosely curled coat. She is very smart and curious and has a really good memory. She loves to play fetch and will play as long as I do and when I quit, she will bring her toy and plop it at my feet over and over until I throw it again. She also loves tug of war! She is a great companion. TJ is 3 years old and everyone loves her "smile". she's beautiful! I have a Maltichon named Fiona and she is very much like you describe TJ. she is so adorable! She seriously does look like she is smiling. I love playful dogs, i think it is better than having a lazy one that sleeps all day hehehe. I have one of each, but love them both tremendously! Enjoy your poochie! Shes looks like a real sweetheart! Baxter was a soft fur ball of a puppy. My Maltese Bichon dog is now two and he has wavvy hair. He is very active but then turns off like a light switch. I had a Vet tell me not to baby him so much so I do not have a lap dog. He is independent while he is active, but a snuggler when he is tired. He gets hair mats even with daily brushing. I would like any secrets on how to reduce them or at home products to help get them out. Is he missing something in his diet? I feed him natural dog food. I swear by natural dog food, he does not have tear stains anymore. Baxter hates rain and loves the snow. He thinks he is a Black Lab or he may be possessed by our previous Lab. He does not go for little toys and love Golden Retrievers. He is very social with people and dogs. He does not know what to think of ponies. I understand how you feel about Baxter. I have Patrick. He is 3 years old and is an amazing animal. He was extremely destructive as a puppy, to the point where I didn't know if I could keep him any longer, when suddenly like a light switch, he stopped. I never thought I would grow attached to a pet, but I am really hooked on Patrick. He is so handsome and the most mild mannered animal I have even seen. He lives to play. He plays hard and crashes like a kid when tired. He was tough to house break and occasionally has an accident but not often. He has a sensitive stomach and only eats food for dogs with sensitive digestive systems or he will get sick every few days. I am told it is not uncommon with this breed.